This past week was a great one to be living in San Antonio. 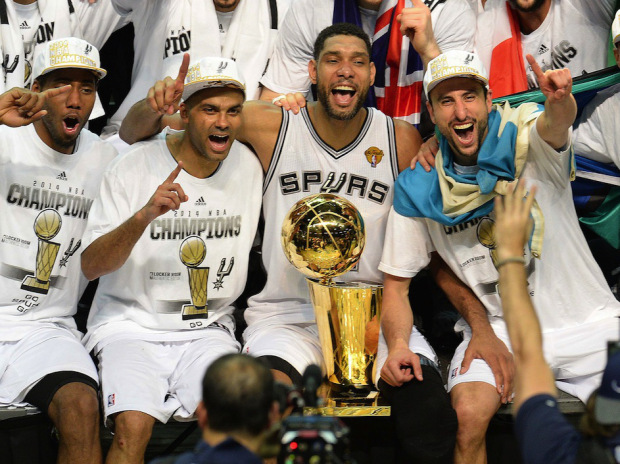 For the fifth time in franchise history, the San Antonio Spurs brought home the title of NBA National Champions. As much as I enjoyed watching Game 5 of the National Championship and seeing the Spurs come back from a 16-point deficit to win 104 to 87, the Spurs have a lot more going for them than just one big win in one big game. Their words and demeanor season after season offer some good, even if simple, lessons. Here are four that I’ve been thinking about. The Spurs, as sportscasters, fans, and bystanders alike will tell you, are a team. But not just in the sense that they all happen to be wearing the same jersey. No, they play like a team. They act like a team. And they win like a team. Benjamin Morris noted that the Spurs “had nine different players take four or more field goal attempts per game throughout the playoffs, compared to just six for Miami.” In San Antonio, everybody gets to play because, in San Antonio, everybody needs to play to bring home a win. Playing as a team, of course, is needed not only on the court, but in the Christian life. To meet the challenges we face, everybody needs to play together. I think of the apostle Paul and all of his teammates, or, as he called them, “partners” (e.g., 2 Corinthians 8:23; Philippians 1:5; Philemon 1:7), in the gospel. With whom do you need to team up so you can share and show God’s love more effectively? When Kawhi Leonard was named Most Valuable Player for the Finals, his shock was apparent – and endearing. I loved how he responded to his high honor: “Right now, it’s just surreal to me,” he said. “I have a great group of guys behind me.” Kawhi knew he performed great in Game 5. But he also knew it wasn’t just about him. It was about them – all the Spurs behind him. In a world where Facebook, Twitter, and Instagram are full of people shouting, “Look at me!” – to have a man point to the men behind him is impressive and important. This is true humility. Indeed, true humility is not about degrading yourself, but about lifting others up, which Leonard did beautifully. Who can you point to in humility? Where you in your life do you need to persevere? Where do you need to take things that go wrong and learn from them so you can do right? The Spurs, as has been well established, have developed an international flair under Coach Gregg Popovich. Eight players on the current roster were born outside the United States. Loosely translated, that means the Spurs use at least four languages – English, Spanish, French and Italian – to communicate among themselves. Boris Diaw, who is from France, converses en français with Tony Parker, who was born in Belgium but grew up in France. Both players also know some Italian, enough to eavesdrop on conversations between Ginobili and Belinelli. Even the two team’s two Australians, Patty Mills and Aron Baynes, have their own dialect. “We’ll hear them and be like, ‘Whoa!’” the assistant coach Chad Forcier said. Tim Duncan, who is from the United States Virgin Islands, is considered an international player by the NBA. During the championship ceremony, many of these players wrapped themselves in the flags of their home countries. The inclusion of so many men from so many places, all together on one team, makes me smile. It reminds me of the promise that anyone from any “nation, tribe, people and language” (Revelation 7:9) can be included as one redeemed by the Lamb through faith. And the more, the merrier. That’s why one of my prayers is that heaven is chocked full. I’d hate to see one empty corner where a person could have been. So would the Lord. He wants as many people included in His Kingdom as possible. Who can you pray for to be included in eternity’s celebration? In reality, these lessons are pretty simple and straightforward. Indeed, I suspect you have probably already learned these lessons somewhere along the way. Nothing in this blog is probably news to you. But lessons don’t have to be esoteric and unknown to be profound and helpful. They just have to be true. And these lessons most certainly are. That’s why I thought we could all use a little reminder. So congratulations, Spurs. And thanks for the lessons. They’re great. Benjamin Morris, “The Spurs Were an Outlier of Unselfishness,” FiveThirtyEight (6.17.2014). Associated Press, “Kawhi Leonard named Finals MVP,” ESPN (6.16.2014). Scott Cacciola, “The United Nations of the Hardwood,” The New York Times (6.15.2014). Entry filed under: Devotional Thoughts. Tags: 2014 National Champions, Basketball, Christ, Christianity, Gregg Popovich, Humility, Inclusion, Kawhi Leonard, NBA, New York Times, Perseverance, San Antonio Express-News, San Antonio Spurs, Teamwork, Values. Diana and I loved your blog! Great job!